Nearly every culture in the world has a hearty, home-style dish, cooked long and slow, that brings to mind childhood nights around the table with family and friends. In Madrid, this “motherly” dish is the humble “Cocido Madrileño”. The Cocido began as a meat-free stew cooked by sephardic jews in the Middle Ages, but since has evolved into a winter specialty of chickpeas, sausage, beef, and vegetables. 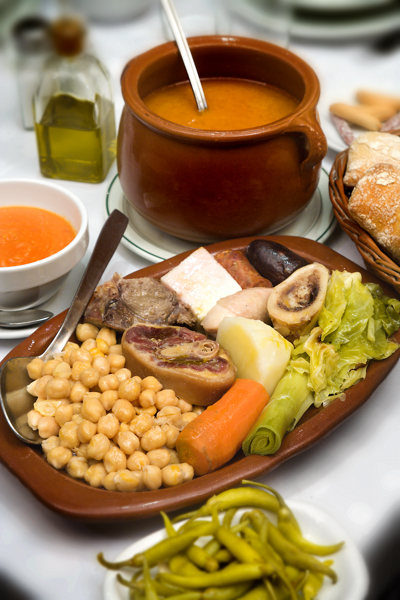 The traditional cocido Madridleño is served in three phases: 1) broth 2) chickpeas and vegetable 3) meat. First, the flavorful liquid in which the meat and vegetables have been cooked is brought to the table in a large urn. Next, a heaping platter of chickpeas, potatoes, and more is presented. Finally, the slow-simmered meat is enjoyed as a rich, final course. Sometimes, to save time, the second and third course are combined. Once a dish of the working class taverns and restaurants throughout the city, now the Cocido Madrileño is mostly a home-cooked affair. However, if you are in Madrid from now until the end of March, you can experience this iconic piece of gastronomic history yourself on the “Route of Cocido”. From February 13th to March 31st 2015, 29 of Madrid’s most classic restaurants will be offering a special “cocido” menu to hungry guests looking to fight off the winter cold with rich broth and plenty of pork. This will be the festival’s fifth year, and in 2014 alone some 10,000 people partook in the celebration.